NOTE – Owls are very sensitive to disruptions in their daily routine or the presence of large numbers of people in their habitat, especially near their nests. So please be very careful not to disturb the owls. And if you really value the owl, do not publicize the locations of their nest. The best time to spot an owl is during twilight, just before the sky becomes dark. In the fall, after the leaves have dropped, face the side of the sky with the setting sun; owls sitting in trees will be easier to spot because their profile will be backlit. Use a tape player to play recordings of owl calls, as owls will usually call back in response. This method works best during the breeding season. However, this is less likely to work will not work on windy, snowy, rainy or windy nights. (Quick note here regarding the use of call playback. Ethical birdwatching requires that the use of taped calls to elicit a response from a bird be used sparingly during the breeding season as there is evidence that this will not only stress the bird but may also encourage them to leave their nesting territory). Nocturnal owls call more often during moonlit nights, both before and during the nesting season. Planning your night-time trips for the breeding season will greatly increase your chances of hearing owls calling from their nesting territories. If you suspect there is an owl nearby but can’t see it, make a squeaking sound for several seconds, then quickly shine a flashlight at the nearby trees. 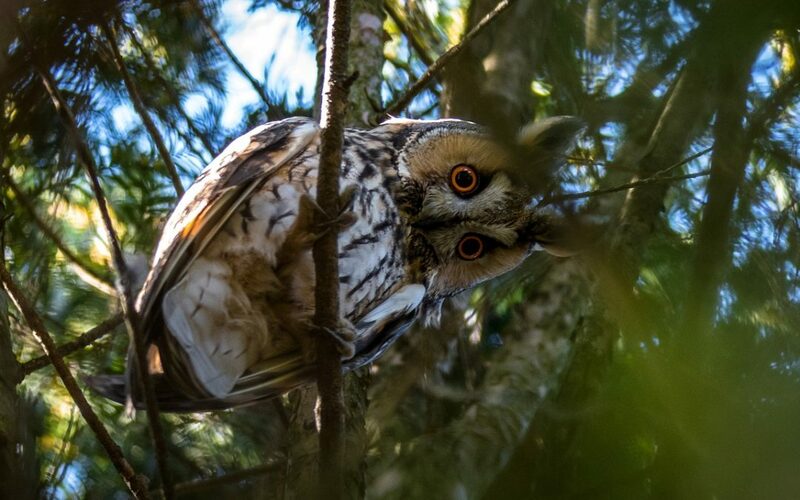 The sound will entice the owl look towards you and the flashlight will reflect off their eyes, creating two shiny pinpricks of light in much the same way that cat’s eyes glow in the dark. Several owl species lay eggs in the nests of hawks or crows. You can locate active nests by walking through likely habitats and looking for telltale signs of owls, such as whitewash (from droppings) splattered on the branches and ground below the nest. Piles of owl pellets found beneath trees usually indicate that the tree is used as a roost site, and during the breeding season, the nest tree will usually be close by. This also holds true for farm buildings, with both perch site and nest site in relatively close proximity.